With increases in global temperatures, the risk of overheating is expected to rise around the world. This results in a much higher dependency upon energy-intensive cooling systems and air-conditioners to provide thermal comfort, but how sustainable is this in a world where problems with the production of electricity are predicted ? 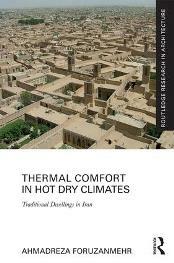 Vernacular houses in hot and dry central Iran have been adapted to the climate through passive cooling techniques, and this book provides a valuable assessment of the thermal performance of such housing. Shedding new light on the ability of traditional housing forms to provide thermal comfort, Thermal Comfort in Hot Dry Climates identifies the main cooling systems and methods in traditional houses in central Iran, and examines how architectural elements such as central courtyards, distinct seasonal rooms, loggias, basements and wind-catchers can contribute to the provision of thermal comfort in vernacular houses.